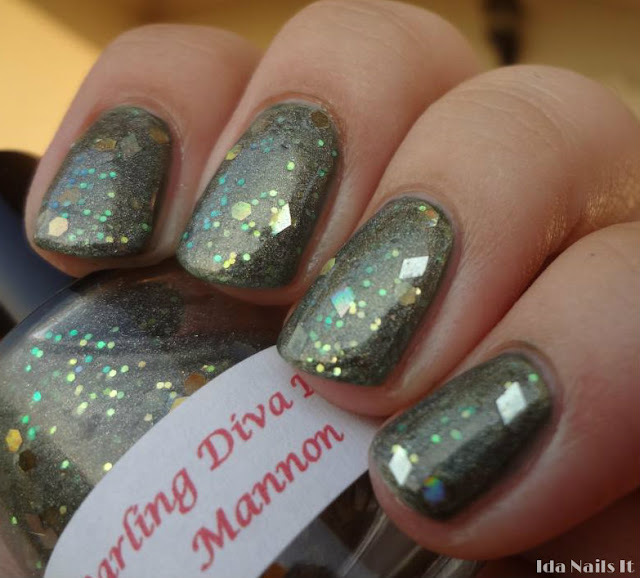 Ida Nails It: Darling Diva Polish Love Bites, Mannon, and Ms. Monster Esq. 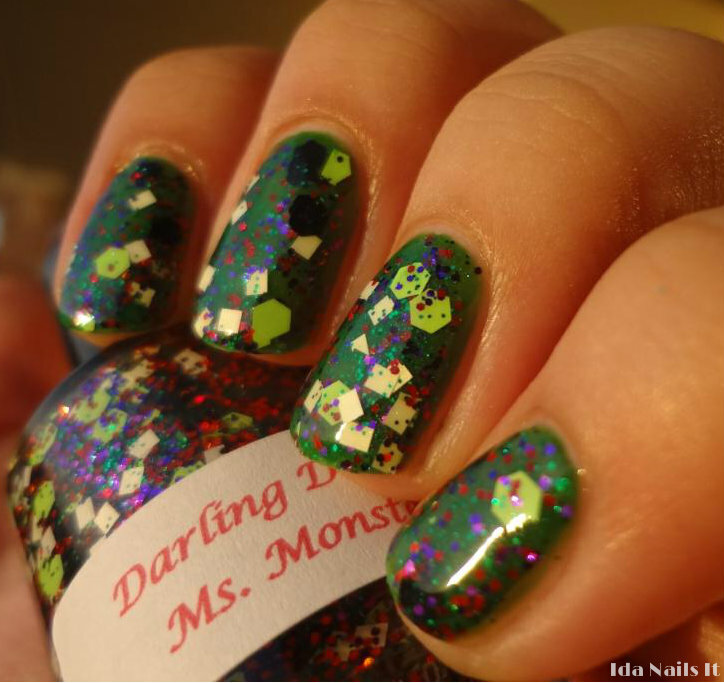 Darling Diva Polish Love Bites, Mannon, and Ms. Monster Esq. 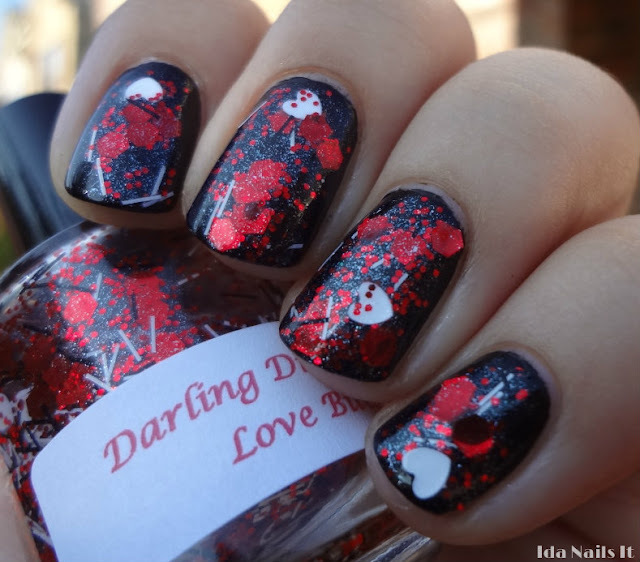 Darling Diva Polish recently provided me some of her Fall 2012 Halloween polishes to swatch and share. 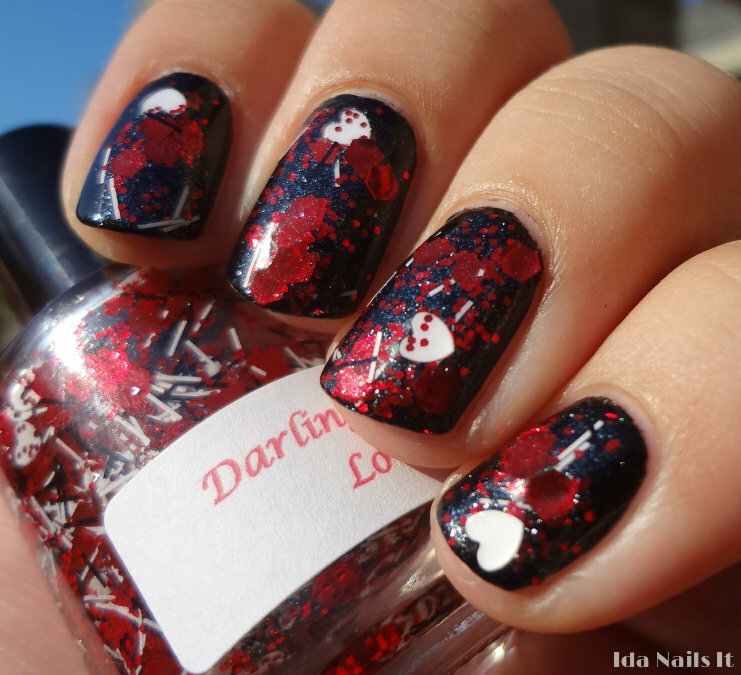 The polishes are so pretty and though they definitely fit into a Halloween collection, they could be worn year around. Overall, the formula for these was great, the polish consistency was not too thick, and there is plenty of glitter which each application. Love Bites has clear base with some shimmer,a bunch of large red hexes, little red hexes, black and white bar glitter, and white heart glitter. No curling for the larger pieces, what looks like curling is just reflective, everything was smoothed out and lay flat with two coats of topcoat. I applied two coats over a black polish base. Mannon is a sage holographic polish with gold diamond and hex glitter and small iridescent glitter. Though it could be worn solo with three coats, I applied one coat over China Glaze Peace on Earth. Ms. Monster Esq. is probably my favorite of the three. It has a green tinted base with such a large variety of glitter, I won't even try to name them all. This is another that could be worn by itself with three coats but I applied one coat over New York Summer Hot Green. Darling Diva Polish can be purchased at her Etsy store and all three of these are currently stocked.